I optimize the way you function its not just my job to give you space but also time. 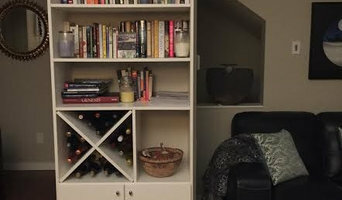 At Closet Factory Colorado we create custom storage solutions for every room in your house that fits your home exactly. We are masters at making closets, entertainment centers, office and garages efficient and easy to manage. With that out of the way you'll have more time for those things that are more important to you. We handcraft designs that fit your needs and style. We offer solutions for closets, garages, offices, wallbeds, entertainment centers, laundry rooms, pantries, mud rooms, wine bars and more. We design with the best practices and build with the highest quality materials. Through experience and education, Organization & Relocation has created and branded a unique organizing system that is detail oriented and ensures that every client receives the highest quality service tailored to their unique needs. Our professional organizers are equipped to handle any relocation or organization job. Based in Boulder, Organization & Relocation serves Colorado, California & other locations upon request. Being organized allows you to pursue your goals and live your life the way you want to. After spending 20 years selling technology I realized that my passion for creating something that was special and unique was much more interesting. I have been designing things since I was 8 years old. This is a perfect fit for me! When I am working with clients I love to educate them on all of the choices within their budget, investigate all the needs, wants, desires and then create the area of their dreams! I have a phenomenal team behind me to help execute any size project with many years of experience with Closet Factory. Denver's Custom Garage Storage Solution | Best of Houzz 2017 - 2018! Being organized just feels good. That’s my mantra and I am sticking to it. My penchant for everything having its rightful place goes back to childhood, when I would rearrange and organize my bedroom, closet, and bath along with the basement play area at least every other month. Those many years of organizing and space planning have served me well as my husband and I have made several cross country moves over the years and “Home Sweet Home” was sometimes tight quarters. My profession as an interior designer began at design school in Chicago; I completed my degree and started my design career in Central Florida. I have been helping people beautify and organize their homes for the past 24 years and facilitating organization is what I love BEST. Why? 1) the instant gratification and benefits of efficiency; 2) the clearing of not just physical space but space in the mind when everything has its rightful place; and 3) the positive effects organization has on one’s day-to-day life. What a great thing – right? Designing for my client’s needs and maximizing the space is essential - form and function first, then comes the FUN with the accessories and aesthetics. Realizing the benefits of organization not only puts a smile on my clients’ faces, it keeps a smile on my face and loving what I do! Design and installation of custom closet, garage cabinets and garage floor coatings, home office, entry way, mud room, craft room, hobby room, wine cellar, pantry, entertainment unit, entertainment center, wine cellars, laundry room, wall beds, custom cabinet and general storage and organizational solutions. Residential and commercial floor coatings. Hunter Douglas window treatment and window covering dealer. Organization and storage solutions for residential and commercial spaces. Custom walk in and master closet design. Custom home office design. 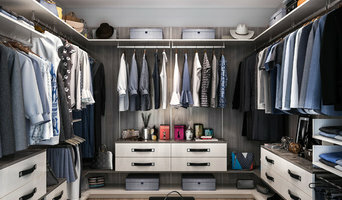 Closets and home storage designers and organizers. 5,000 square foot interactive showroom. Since 1991, Closet Factory has been designing and installing custom storage units across Colorado. As the largest closet company in Colorado, Closet Factory has helped over 70,000 people organize multiple spaces in their homes. 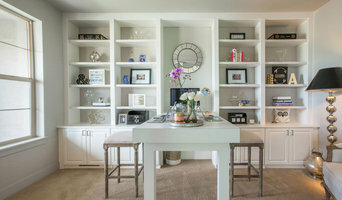 Because we know each homeowner is unique, our highly-trained designers work closely with our clients to create a completely personalized system that meets their storage, aesthetic and budgetary needs. The pieces are then cut on-site in our Centennial factory and installed by our experienced and skilled installers. Each unit is beautiful, functional and uniquely you! Closet Factory is also "The Professional's Choice." When Builders, Interior Designers, Decorators, General Contractors, Real Estate Agents, Home Re-Modelers, and other professionals need storage design and installation throughout the home or the office, they call Closet Factory. Who you refer your customers and clients to can be a great success or a catastrophic error. Closet Factory Designers, Installers, and our entire staff do the job right, and are always sensitive to the needs and requirements of property owners, as well as mindful and respectful of the work of other contractors working on site, working as cleanly and quietly as possible, and leaving the work site in "move-in" condition! Whether you have a master bedroom walk-in closet, a kid’s reach-in closet or a luxury dressing room, we will work with you to discover your unique needs, style preferences and budgetary requirements. Everything we offer is 100% made-to-order and cut-to-spec using locally sourced materials, meaning no two designs are ever the same. We allow YOU to control the budget of your project by selecting the components, materials, and accessories that go into your finished design. Smart Spaces was founded in 2004. Locally owned and operated in Denver, CO. We design, manufacture, build, and install without outsourcing. Our non-commissioned designers are experienced in working with CAD software to uniquely design to work with your specific needs. California Closets Denver is family-owned and family-operated. We have become the Denver area’s leader in high quality custom closet, home office, garage, laundry room, entertainment centers, and kitchen storage solutions. Our designers have an unrivaled reputation for creating stunning customized designs that create the perfect solution for unique storage challenges. Our highly skilled design staff is fully equipped to bring many samples to you in your own home for an in-home design consultation that includes the technology to provide a 3D design on the spot during the initial consultation. Sorted is a home organizing business focused on helping clients to bring order and balance into their homes. Sorted's goal is to assist clients in the organization of their homes and has been doing so for over 10 years. Working toward a functioning system in your home by banishing clutter and disorganization can naturally lead to a stress-free environment. It is an enjoyable experience transforming cluttered and unorganized areas in a client's home into harmonious working and organized household systems. There is a calm feeling when you enter a space and feel the fresh energy of well placed furniture and clutter free rooms. By achieving this calm through organization, it is our hope to create harmony and balance within a home for clients to enjoy instead of the feelings of discouragement they feel living with disorganization. There is a direct correlation between feeling stressed and overwhelmed at home with the piles, packed closets, crammed drawers, and the abundance of "stuff" surrounding you. Sorted can assist you with creating a clutter-free and balanced environment. KiO is the newest, most innovative shelving product on the market today! It is made of a unique material new to the shelving and closet industry. Manufactured in the USA, KiO is super- strong though also lightweight making it easy to purchase, transport, and install. An eight-foot closet weighs under 40 lbs. and can be installed in less than an hour. Perfect for home or office organization including: closets, pantries, garages, bookcases, limited only by your imagination. Beautiful and simple to install! We design and install organization and storage systems for your whole home, from closets to office, Murphy wall beds, mud room, laundry room, pantry, entertainment center, garage, and anyplace else you need a custom storage and organization solution. Synchronized Spaces are home organizers that will create a clutter free home or office and help eliminate stress while solving your organizational challenges. Synchronized Spaces will come in to your home and design systems and processes that will allow your household to operate more efficiently. We will declutter and reorganize to fit your family's lifestyle. This, in turn, will allow you and your family to save time and money. An organized home will increase the quality of your life by reducing the clutter around you. It will free up time for you to enjoy the more important aspects of your life. There is a spot for everything..let Synchronized Space help you find it. Closet & Storage Concepts Colorado is a LOCALLY OWNED custom cabinet company specializing in closets, garages, mud rooms, built ins, wall beds, home offices and much more! We produce our cabinets locally in Colorado and offer everything from melamine to 100% solid wood structures in most species and door styles. We are a pair of dynamic, creative and professional women who have a passion for changing the lives of others through the power of decluttered living. We strongly believe that the key to a happier life lies in simplifying and organizing a household. Less is more! We gladly work in all areas of your home or office and provide advice regarding what to keep or purge. We provide creative storage solutions that are tailored to each client's needs, space and style. We also assist realtors with preparing your home for sale by decluttering and staging so that it can earn top dollar in today's competitive market. Before hiring a professional organizer, consider exactly what you need. 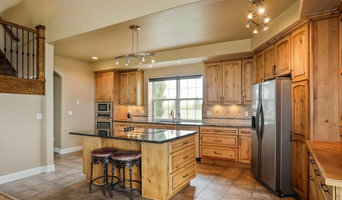 Have you just moved into a Commerce City, CO home and have no idea where to put everything? You may want to consider an organizer who specializes in room-by-room space planning or estate organization. Perhaps you’re faced with a tiny closet and an overflowing wardrobe. In that case find a professional who focuses on closets to help you get back on track. Also consider the types of objects that need organization. Are they items like books, family photos, files or collections? You’ll want a professional organizer who has experience designing custom systems with Commerce City, CO companies that will best fit your needs. Find a professional closet and home organizer on Houzz. Narrow your search in the Professionals section on Houzz to Commerce City, CO closets and home organization.